December 29th and 30th enjoy laser shows set to the music of various artists. 9:00pm - Pink Floyd: Echoes 10:00pm - The Best of the Doors 11:00pm - Pink Floyd: Dark Side of the Moon Midnight - The Best of Led Zeppelin. Admission is $7.00 adults, $4.00 children per show. The Museum is located at 3280 S. Miami Ave. Call 305-646-4200 for details. Macy's at the Falls reopened on November 4th after being closed due to damage last year from Hurricane Wilma. Saturday, December 23, 2006 12:00pm - 2:00pm. Holiday characters from the North Pole and Caroling. Holiday music and the children's musical Calling All Angels, Sunday Dec. 17th at 3pm. The church is located at 7500 SW 152nd St. Call 305-233-8711 for more details. Saturday, December 16, 2006 10:00am - 12:00pm Mrs. Clause Storytelling, Fountain Area. 12:00pm - 3:00pm Meet & Greet Curious George at the Center. Don't forget to bring your camera! At Pinecrest Gardens (11000 Red Road) on Saturday December 16th, from 11am-4pm. 30+ tons of snow, food, games, and art & crafts. Admission is $6 for adults, $5 for seniors, kids 3-12, $4. For more information, call 305-669-6942 or see the flyer. Explore the various habitats of the park while finding and identifying numerous butterfly species. Free with paid park admission: $7 adults; $5 children. Dec. 16th 2-3:30 pm. The estate is located at: 16701 SW 72 Ave. Call 305-235-1668, ext. 242 for more details. On Saturday, December 9th, join Santa Claus at 10 am at the Deering Estate and listen to him read this classic tale. Be sure and bring a camera to take photos of Santa. For more information call 305-235-1668 ext. 233. Saturday, Dec. 9th from 3-6 pm. $25. Enjoy the sunset of Biscayne Bay from your canoe. Enjoy a leisurely paced canoe trip through scenic mangrove creeks and along the shore of Biscayne Bay . Call 305-365-3018 to register. Meet at Black Point Marina, 24775 SW 87 Ave.
On Dec. 2nd from 7-10 pm. Enjoy an evening of classical holiday music with the Alhambra Orchestra and the choirs from New World School of the Arts and Ransom Everglades School. The beautiful front lawn and grounds of the estate serve as the background for this annual concert. Adults $15.00 in advance; $18.00 at the gate. $10.00 for children 4-14. The estate is located at 16701 SW 72 Ave. For more information call 305-235-1668 ext. 233 or visit www.deeringestate.org. Saturday December 2nd at 7:30 pm. Enjoy a full orchestra, choir, drumline, sing-a-longs, ethnic music and selections from “the Messiah” This event takes place at the Old Cutler Presbyterian Church, located at 14401 Old Cutler Rd. Call 305-238-8121 or visit www.ocpc.org for details. On Saturday, Dec. 2nd from 10:30am -12:30pm, join in the festivities as Santa takes time out of his busy schedule to visit Cutler Bay. The fun begins with a parade at 10:45. see ribbon dancers, jugglers, stilt walkers, Dickens carolers, unicyclists and a Dixieland Band. Enjoy complimentary finger foods and gift give-aways at participating merchants. Nov. 25th from 11am -6pm and 26th from 12-5 at the sunshine pavilion, Miami Fair Expo Grounds (109th Ave and 24th St.). There is still time to get your flu shot. Until November 18th, area Publix, CVS, and Walgreen's stores will administer flu shots to the public. Prices may vary. For more information and schedules. On November 18th, from noon - 4pm, Cutler Bay police will be at Southland Mall, Center Court, to give shoppers safety tips for the holiday season. There will also be child fingerprinting and information and discount coupons for LoJack, The Club, and car alarm systems. There will also be car VIN etching kits and other related items. At the Center Court of Southland Mall, Saturday November 18th, from noon - 2pm. The Singing Miamians of Pinecrest, a barbershop harmony group, present a look back in time through song to the roaring 20's. See and hear local high school quartets. The Performance is this Saturday, November 18th at 7:30 pm at Robert Morgan Educational Center Auditorium, 18181 SW 122 Ave.The money raised is used to supplement music programs at Miami Dade high schools. For additional information call 305-274-7464 or see the flyer for this event. On Saturday, November 18th, at Dodge City (16630 SW 147th Ave, just west of Metrozoo) Kids Hope United is sponsoring an afternoon of games, prizes, food, bounce houses, and more to celebrate families who are finalizing adoptions. The event to open to the public. For more information. This 2 day festival running Nov. 18th and 19th features,handmade arts and crafts, live music,historical reenactments, children's activities,antique cars and plenty of food. From 10am to 5pm at the fair expo center. Cost is $6.00 for adults $2.00 for children 5-12. Visit http://www.hmsf.org/programs-Harvest.htm for more information and to download a $1 off coupon. You can also call 305-375-1492. November 18th at 4:00 pm. The parade features marching bands, vintage cars, costumed characters and the marks the arrival of Santa. At The Falls shopping center. At the October 4th town council meeting, the council agreed to create a citizen advisory committee to address senior citizens transportation needs. If you would like to become a member, please contact the town council. The Woman's Club cordially invites you to become acquainted with the personal History of Cutler Bay settlers, and to find out more about the many community and charitable projects they participate in throughout the year. Come join them for coffee at 10 am on November 14th at the Cutler Ridge Park. RSVP Dolores at 305-234-9266. Cutler Properties LC is expected to ask for a deferral at the EQBC hearing on Thursday, November 9th to allow them time to meet with the community. Cutlerbay.net readers sent out in excess of 100 emails in 2 days! Thank you for your response!!! We will keep you advised as additional information becomes available. This Thursday morning at 10am,the Environmental Quality Control Board will be meeting and may approve an environmental variance allowing Cutler Properties LC to fill in approx. 30 acres of Cutler Bay wetlands in order to build additional high density housing. This should not be allowed to happen without the residents of our community having the opportunity to voice our concerns. PLEASE, TAKE 5 MINUTES TO SEND THE ATTACHED E-MAIL OR WRITE ONE OF YOUR OWN. Cutler Ridge Concerned Citizens meet on the first Tuesday of the month in the community room of the Southland Mall at 7pm. The next meeting is scheduled for November 7th. These meetings are free and open to all Cutler Bay residents. The guest speaker will be Cutler Bay Town manager Steven Alexander. Early voting began on October 23rd for the November 7th election. Get the early voting schedule, location of Cutler Bay's precincts and the sample ballots. Get information on, candidates websites, as well as impartial websites to help you make an informed decision. Nov. 4th from 9am-3pm at St Thomas by the Bay Lutheran Church. Features handmade items, baked goods and a lunch cafe. 17700 Old Cutler Rd. Free. Call 305-232-1227 for information. Nov. 5th from 8am to 5pm. Sale features hundreds of Christmas and craft items created by church members. 20740 Old Cutler Rd. Free admission. Call 305-235-6651 for more information. This Saturday, November 4th from 9am-1pm at Goulds Park Gym, 11350 SW 216th St (map). Participants will receive a $75 gift card from Publix, BJ's, or Wal-Mart, no questions asked. For more information. Beginning October 2nd, area Publix, CVS, and Walgreen's stores will begin administering flu shots to the public. Prices may vary. For more information and schedules. There's a lot to do this weekend if you're looking for Halloween fun. See local places to go and things to do from now until Halloween. And to make Halloween safer, the Cutler Bay police will be out in force on Halloween evening. The Florida Department of Financial Services has started a program providing up to $5000 in matching funds for home improvements to help protect homes from hurricane damage. For more information. On October 21st and 22nd, "Thinking of you Services" will be inviting people to express their gratitude to our troops overseas by taking a few minutes to sign a Christmas Card. This event takes place at Southland Mall between 12 noon and 6:00 pm near the Food court. If you need more information, wish to make a donation, volunteer your services, or if you know someone serving overseas, call Freddie Ambrose at 786-252-2798. Friday, October 20 from 6 p.m. to midnight. Saturday, October 21 from noon to midnight, Sunday, October 22 from noon to 10 p.m. At the German American Club, 11919 SW 56 St (map). Enjoy authentic food, live entertainment, carnival rides, and of course BEER. Grand prize: 2 tickets to Germany. Tickets prices: 12 & under:free, 13-20:$1.00, adults:$10. For more information. This Saturday, Oct. 21, from 7pm - 11pm. Join in for an evening of casino style gaming, hors d'hourves, an auction and raffle. Proceeds benefit the Rotary Foundation's supporting Childrens charities. Tickets are $45.00 and include 30 Casino "fun" chips. This event takes place at the Palmetto Bay Village Center (184th Street and Old Cutler Rd.). For more information call Maria Kesti at 305-323-1520. Register for the Susan G. Komen 2006 Race For The Cure, which will take place on October 21 at Bayfront Park, or donate online. For more information, or call (305) 666-RACE. On Saturday,October 21. This annual event features artists, food, music and kiddie rides. The Church is located at 18455 Franjo Rd. Call 305-235-5442 for details. The grand prize winner of the Cutler Bay town logo contest is Palmetto Bay resident Cathy Gibbs Thornton. See the winners and all of the finalist's entries and photos of the winner at the Oct 4th town council meeting. The winning entry was modified for use as the official town logo. On Wednesday, October 18th at 10 am, meet Award-winning author Sharon Draper, author of Copper Sun. Visit www.mdpls.org or call 305-375-book for more details. This Saturday from 4:30 - 7:00 pm, enjoy a homemade spaghetti dinner with salad, garlic bread and desert for just $6.00 ($3.00 children) and help out a good cause. Proceeds benefit Princeton-based Boy Scout troop #69. The dinner takes place at the Boy Scout Hut, 15415 SW 256th St. Call 305-245-2883 for more information. 2 officials, both formerly with the City of South Miami, are among the officials who have joined Cutler Bay's administrative staff. Don O'Donniley is the new Planning and Zoning director and Alan Ricke is the new Parks and Recreation director. Read more in this article from the Miami Herald. From October 5-11th, you can purchase energy efficient appliances costing less than $1500 and pay no tax. For more information. Join the Miami Dade police and fire departments at Best Buy (19191 S. Dixie Hwy), this Sunday, October 8th, from 11am-4pm. Meet the mounted police and the K9 police along with the fire department. There will be child fingerprinting / DNA registration, fire safety and child car seat safety. There will also be a raffle every hour for a $50 Best Buy gift card. The Florida Fisherman Fishing and Boat Show will be held at the Fair Expo Center of the Miami Dade County Fair and Exposition Center (10901 Coral Way) this Saturday and Sunday, October 7 & 8. Ticket prices are $7 for adults, 12 and under are free. For more information. Celebrate the harvest moon with a selection of wines, fine food, jazz, and a natural photograghy exhibit this Friday, October 6th from 7-9:30pm at the Deering Estate (16701 SW 72nd Ave). Tickets prices are $45 in advance or $50 at the door. For more information,see the flyer. For tickets or to RSVP, email or call 305-233-5858. At last Tuesday's town council meeting, 2 ordinances were passed. The first ordinance limits the amount of days a POD (storage container) can be left at a residence to 14 consecutive days. The second ordinance bars streetside vendors from selling merchandise in nonresidential areas. Among the items on the agenda is the creation of a citizen advisory committee to address senior citizens transportation needs. 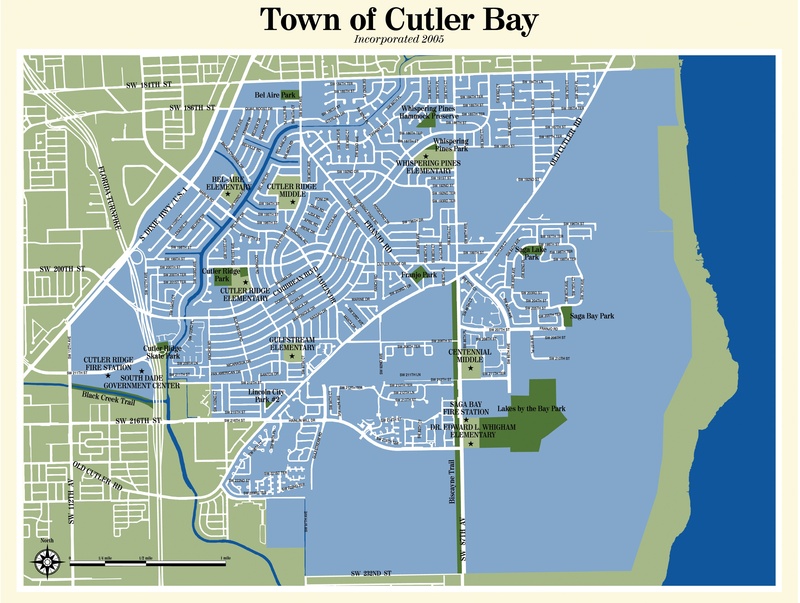 The next Cutler Bay Town Council meeting will be held on Wednesday, October 4th, 7pm, at the South Dade Regional Library (map), 2nd floor. Read the agendas for the council meetings. Among the items on the agenda is the creation of a citizen advisory committee to address senior citizens transportation needs. Cutler Ridge Concerned Citizens meet on the first Tuesday of the month in the community room of the Southland Mall at 7pm. The next meeting is scheduled for October 3rd. These meetings are free and open to all Cutler Bay residents. The guest speakers will be representatives from FP&L discussing vegetation management in Cutler Bay. Also speaking will be Seat 3 Councilmember Ernie Sochin. Picture of Vice Mayor Ed MacDougall, who was officially sworn in during the September 19th town council meeting. On Friday, September 15th, the body of a male newborn infant was discovered floating in a canal located at approximately 208th street and SW 103rd place. Anyone with information regarding the above incident is requested to contact Miami-Dade police detective D. Aiken at (305) 471-2400 or Crimestoppers at (305) 471-TIPS (8477). Florida law allows for a newborn child to be left at any fire station or hospital. You do NOT have to give your name. Please spread the word concerning this life saving option. On Sept 28th, from 5pm-8pm, Cold Stone Creamery stores (including the store in the Old Cutler Town Center), are having an ice cream social. Get a free sample of "Cole's Creation" ice cream, enjoy family activities, and please make a donation to the Make-A-Wish foundation. For more information. There will be free admission to Viscaya (map) to all visitors this Sunday, September 24th, from 9:30-4:30pm. Enjoy performing arts, art activities, lectures, and tours. Contact 305-250-9133 for more information. View pictures of the Cutler Ridge Soccer Club 2006-2007 season opening day and the dedication of a tree to John Cosgrove. 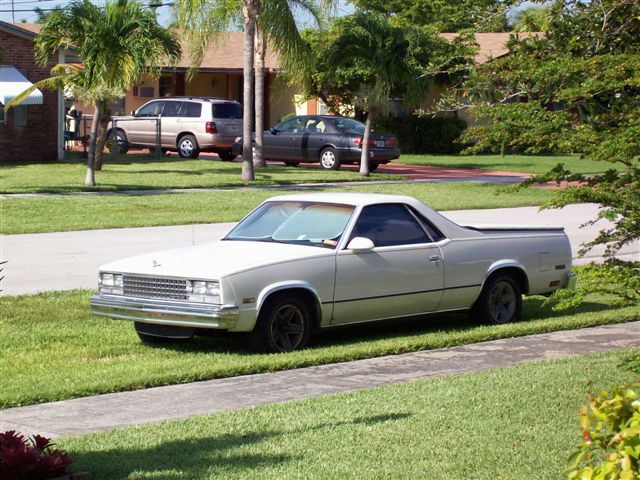 "Humility is the only certain defense against humiliation"
A 1987 Chevrolet El camino (picture) was stolen from a Cutler Bay residence last Thursday, Sept 14th, between the hours of 1:00am and 6:00am. If you see this car, please contact the police at 305-4-POLICE (476-5423).